We've discovered like those working with natural medicine for millennial, that often it is Nature that Nurtures the body best back to health. Omsho Crysalis works with the Energetix homeopathic line. We help your body with many issues such as IBS, Diverticulitis, Shingles, Parasite, etc etc. The list is as long as the body. Come have an Ionic Foot Detox and lets see what your body is saying. Recommendations may be made after your Ionic Foot Detox or by special appointment. You may also use the document below to help chart your own desired combination needs. 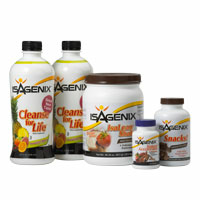 Omsho Crysalis works with Isagenix Nutritional and Cleansing products. From weight loss solutions to pre/post operative recovery assistance.